Almost every family in Scotland has someone, either a direct ancestor or more distant relative, who was lost during the Great War of 1914-1919. For many, it may be a great-grandfather, a great uncle or a distant cousin. This is the name they perhaps think about when we fall silent each year on the 11th November and when the fading images of this tragic war are shown on TV. In my Lawrie/Bruce family line, which comes from Aberdeenshire, we have Frederick Bruce, my great-great Uncle. The exact details and date of Fred’s death will never be known however according to the Commonwealth War Graves Commission he was killed on or around the 14 April 1918 during the last gasp German Spring Offensive. This Saturday will, therefore, mark the centenary of his death at only 21 years of age. Through this blog I hope to commemorate Fred and the sacrifice made by him and many other young men. After this year when the centenary of the Great War passes it will be too easy for future generations to forget Fred Bruce and their like. My Uncle Albert Lawrie told me that at Remembrance Day Services my Granny Lawrie, Fred’s niece, always thought about her Uncle Fred. He has never been forgotten by the family and I hope, through blogs such as this, that as the years and generations pass we can keep his memory alive. Frederick Bruce was born at a farm called Bethlin in the Parish of Midmar, Aberdeenshire in the early morning of the 4th January 1897. His father, William Bruce worked as a farm overseer at Bethlin. His mother, Jane Reid McKenzie, was originally from nearby Cluny, with the couple marrying in 1871 at Cluny. Fred was the youngest of twelve children. His oldest sibling, my great grandfather Peter Bruce, was born in 1875 and was therefore 23 years old when Fred was born and already working away from home. He would be married three years later in 1900 in nearby Kinellar to my great grandmother Mary Wyness. By the time of the 1901 Census, the family and 4 year old Fred have moved a short distance from Bethlin to the farm of Bents, also within Midmar Parish. His father William Bruce worked as a grieve on the farm. A grieve was the supervisor of the other farm servants on larger farms and would be an older and more experienced man. In the Census Fred is living with his parents, three of his sisters and a nephew, James Cruickshank, who is the same age as Fred. Generations would commonly overlap in this fashion, not due to re-marriage, but simply the size of the families. At some time in the next ten years, William Bruce moved his family a few miles east to the Parish of Skene. Fred attended the Central School in Skene. By 1911, Fred was now 14 years of age but still at school. His father William was now 64 years of age and perhaps reflecting his advancing years, he is working as a general labourer rather than a farm grieve or overseer. Also at home were his three sisters Eliza (34 years), Jane (26 years) and Harriet (20 years). Also present was another of his undoubtedly growing list of nieces and nephews from his older siblings – five-year-old James Bruce. By the time of the outbreak of World War One in August 1914 Fred was 16 years of age and as yet too young yet to join up. We can only guess whether he was keen to join up or full of trepidation. It would be normal for a young boy to leave school at around 14 years of age. Fred followed the family trade and became involved in farming. Unfortunately, his military record and details of his employment have not survived but it may well have been that he worked on the local farms with his father. By early 1916 the losses suffered in battles such as Loos and a growing experience of a war of attrition led to the passing of the Military Act when compulsory enlistment was introduced. Fred, single and now 18 years of age was the ideal candidate to be enlisted. On the 14th July 1916, in the shadow of the tragic opening days of the Battle of the Somme, Fred Bruce joined the 7th Battalion of the Gordon Highlanders and went off to war. For a young man who probably had only travelled as far as Aberdeen the opportunity to travel to experience life in France and Flanders must have been exciting. The 7th Battalion of the Gordon Highlanders was a Territorial Battalion, formed in Banchory at the start of the war and known as the Deeside Highland Battalion. After initial training and embarkation, the Battalion joined the 153rd Brigade of the famous 51st (Highland) Division. It was involved in the Battle of Festubert and the Second Action in Givenchy. Early in the Battle of the Somme, the battalion took part in the attacks on High Wood, a heavily defended German defensive position on the Martinpuich to Lengueval Road. 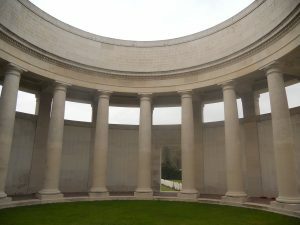 They were unable to take the Wood and suffered over 2,000 casualties between 22 July and the 7 August 1916 and were unfairly criticised by senior officers in the army. 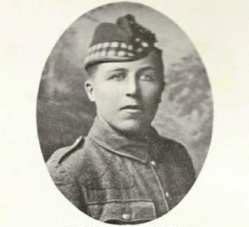 Fred Bruce, having received his initial training, would have been drafted in to replace those lost at High Wood. He would not have long to wait for his involvement in a major battle. The Battle of the Ancre took place between the 13 and 18 November 1916 and would be the final large-scale battle of the Somme offensive. At around 6 am on the 13 November 1916 the attack began with a creeping artillery barrage. The 7th Gordons were located on the extreme right of the attack and by 6.45am they had successfully reached their initial objectives. Elements of the 7th Gordons were attacked by Germans defending Y Ravine but held their ground before being relieved by other Gordons. 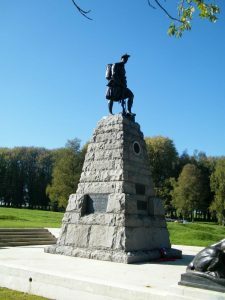 After days of heavy fighting, the 51st Highland Division finally captured Beaumont Hamel and was relieved from the front on the 24th November. The capture of Beaumont Hamel significantly enhanced the Division’s reputation and gained them the nickname of The Fighting 51st. One can only guess at how young Fred coped under fire. We can assume that for someone who a trip to the city lights of Aberdeen was probably his furthest journey before 1916, the barren and wasted landscape of Flanders can barely have been more different to the lands he had lived and farmed in Aberdeenshire. He would also have more opportunity to reflect on his family just as he survived his first real battle. Whilst the fighting at Beaumont Hamel drew to a close, back in Scotland his father William Bruce died on the 26 November 1916 at Skene due to cancer. He was 69 years of age and is buried in Kirkton of Skene Kirkyard. Having experienced the slaughter on the Somme Fred and the 7th Gordons were involved in a number of battles during 1917. These included the Arras Offensive in Northern France and the Battle of Pilkem Ridge and Menin Road Ridge, both part of the notorious Third Battle of Ypres or Passchendaele. The Division was also involved in the capture of Bourlon Wood as part of the Cambrai operations where the first mass use of tanks in a battle took place. In 1918 the Division, including Fred, now 21 years of age, were still based in the area of Cambrai on the 21 March 1918 when the Germans launched a huge counterattack, later known as Operation Michael. The Division and the rest of the allied armies were forced to give up much of the ground gained in the battles of 1916 and 1917 and Fred and his colleagues were involved in a number of key rearguard actions through Beaumetz towards Bapaume. In that time they lost over 4,900 casualties. However, we know that Fred survived this initial attack. The German attack ended with significant gains made but no final breakthrough achieved. 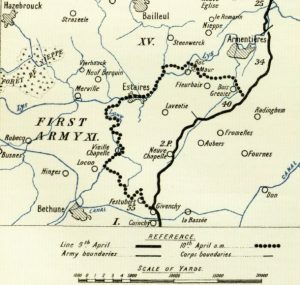 On the 1 April the 51st Highland Division moved out of the line and moved to what was hoped would be a quieter part of the front. Unfortunately for them, they lay in the path of a second German Offensive, now known as Operation Georgette, or The Battle of the Lys. Fred and his colleagues were based at Bethune in Northern France. On the 9th April, the German Army launched their second offensive across 25 miles of the front south from Ypres. The defenders were quickly overwhelmed and the Germans were able to advance more than three miles in the first three hours. The British and Portuguese Army fought hard to hold the line but were required to give up ground. Heavy casualties were suffered by the 152nd and 153rd Brigades, the latter of which included the 7th Gordons and these Brigades were forced to form a composite force due to the losses suffered. The exact details of when Fred died may never be known. His death has been recorded as having occurred sometime between 10th April and 14th April, presumably when officers had time to assess and count their losses. His body was never recovered. You can only imagine Jane’s horror and anguish when within a few days she received the additional and more tragic news that her youngest son, Fred had been killed. It seems so much for one person to suffer in such a short period of time and highlights the danger of family members serving together in the same units. The Aberdeen Evening Express of the 8 May 1918 officially reported the death of Fred detailing that he was killed in action between the 9th and 14th April. War of course is always a bonus for bureaucrats and amongst some of the most touching records available are the UK Army Registers of Soldiers Effects. These detail the money and belongings returned to the next of kin of officer’s killed or who died in service. The record gave details of Fred’s death between the 9th and 14th and his mother Jane received the sums due on the 12 December 1919. Fred, like other soldier’s, was encouraged to complete a will before heading off to war and an Inventory presented at Aberdeen Sheriff Court shows that his total estate of £59 5s 5d, including the £14 15s 10d of pay due to him by the War Office. This was granted on the 21 August 1918 to his mother. 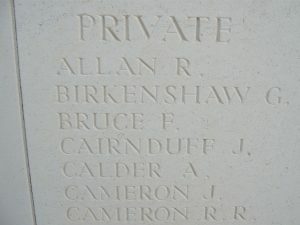 Fred Bruce is commemorated on the Kirkton of Skene War Memorial in Aberdeenshire. It was unveiled in April 1921 with the names of 33 men from the Parish who died in the war, a heavy toll for a small rural parish. 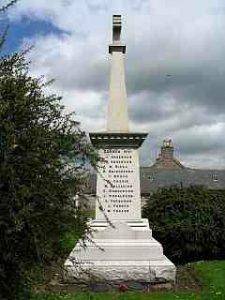 During the service the names of the 33 lost were read out and the memorial, comprising of a “fine-axed Kemnay granite obelisk” was unveiled by Brigadier-General G. G. H. Hamilton, DSO of Skene. Amongst the tunes played at the service was that anthem of Scotland’s loss in wars and conflicts – Flowers of the Forest. In 2011, accompanied by my wife Julie and my then 7-year-old daughter Emma, I visited the site in Belgium where Fred is commemorated. His body was never recovered and he may still lie at peace in some field in Flanders as yet undiscovered. Alternatively, he may lie under one of the hundreds of headstones for unknown soldiers with the emotive statement “A Soldier of the Great War” and “Known Unto God”. There in a list of names and almost 700 miles from his homeland of Aberdeenshire is carved the name BRUCE, F. It seemed a small and somewhat unremarkable commemoration to a 21 years of a life lived and whose loss which must have had such an impact on his family, not least his mother Jane who lived only 2 further years after his death and died in September 1920. As the Centenary of World War One draws to a close in 2018 efforts are now being made to ensure that the records and histories of those lost are retained for future generations. For those killed in World War One who had children back in Britain and other countries, their loss in most respects is more tragic. However, their remembrance is almost assured by current and future descendants. For those lost so young and before they married and had their own offspring the danger is that their stories are forgotten and memory lost. It is so important for those of us who have people such as Fred Bruce in our family trees to ensure that their service and loss are never be forgotten. As the centenary of Fred’s death is on us may he rest in peace and never be forgotten. Excellent research. I teach at Westhill Academy and we have a display in our History department that features the faces of Fred and the other men from the area commemorated on the memorial using the photos and information from the booklet produced when the monument was unveiled. Can you provide me with any detail you may have of the soldiers inscripted on the memorial, if you have the website where the booklet can be downloaded or you could send me a pdf that would be great. I clean the graves and repaint the memorial and it would be wonderful to have some background to show my children the soldiers I am doing it for.